A Bohemian attic flat in Kensington. Three old men, arguably some of the most influential minds in twentieth century art, are recalling the highs and lows of their lives at the creative cutting edge. As the scene shifts to the Paris of their youth - vibrant, dangerous and free - we explore the passionate and volatile relationships that bind these three artistic pilgrims as we journey with them back to the present, and a surprise... What is Art? Why would anyone bother with it? What is the passion that impels the creative spirit? And can you love something enough to kill for it? Stoppard's seminal radio play is translated to the stage, combining all his hallmark wit, insight, style and passion with a twisting plot and denouement that are guaranteed to fascinate, thrill and entertain. FRESH from a long couple of days covering elections, I knew it would take a good performance to keep me awake through Saturday night. So all credit OVO whose captivating performance of Tom Stoppard’s Artist Descending A Staircase proved to be completely compelling and banished any tiredness. The peripatetic OVO are in another new home and hopefully, this one will be for keeps and they can put down roots. Their Pudding Lane location – above Rymans – might seem to be a strange location for a theatre but it works surprisingly well. It was particularly appropriate for Artist Descending A Staircase because it is high up in the building and the play, as its name suggests, hinges on stairs and to a lesser degree windows. 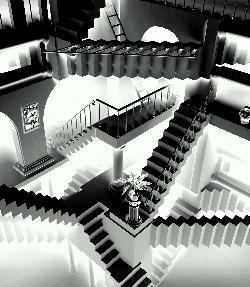 Artist Descending A Staircase is not one of Stoppard’s best-known plays but it is very thought-provoking. Chronologically it moves back into the past and then forward again, a device which, in lesser hands, could be irritating but works exceptionally well. With the exception of one woman, the blind Sophie, the cast comprises six men but three characters. Oscar Blend, Kieran Cummins and David Berryman play the older Beauchamp, Martello and Donner respectively while Alex Bell, Matt Corcoran and Rob Ferguson play their younger counterparts. We meet the older Beauchamp and Martello after they discover that Donner has died after falling down the stairs of the apartment they share. From then on the play explores how they came to that point and the influence of Sophie on the lives of at least two of them. Both Kieran Cummins and David Berryman as the older Martello and Donner are well-known on the local stage and give the kind of assured performances you would expect from them. Oscar Blend as Beauchamp is a newcomer to OVO but slots in seamlessly. The younger team are equally impressive with Matt Corcoran outstanding as the idealistic Martello backed by strong performances from Alex Bell and Rob Ferguson. Lucy Crick gives a remarkably good performance as the blind Sophie – sightlessness is not easy to act yet she made it seem effortless. Despite not appearing until a good way through, she is the catalyst for everything that happens – or is she? Ed White makes his directorial debut with Artist Descending A Staircase and clearly feels comfortable with the staging of a play originally written for radio. Thanks to him and his team, both on and off stage, OVO can justifiably claim to have scored another success.